Economies have fallen, freedom has been suppressed, and peace is a distant memory. The world is falling apart. Joshua Jordan's protege Ethan March, along with Jimmy Louder and Rivka Reuban, have been left behind in a world that is rapidly coming under the complete influence of the Antichrist. Technology is growing by leaps and bounds, with BID-Tag implants, robotic police units, and drone-bots flying overhead...all designed to control and dominate those who resist the Antichrist's reign of evil. As Biblical prophecy is fulfilled each new day, Ethan and the others in the Remnant struggle to eat, to procure necessary goods, and to avoid the Global Alliance - in short, to survive. But when the forces of evil attempt to pervert the world's most powerful information system to their own sinister ends, eliminating everyone who gets in their way, it's up to Ethan and the Remnant to subvert their dark ambitions. 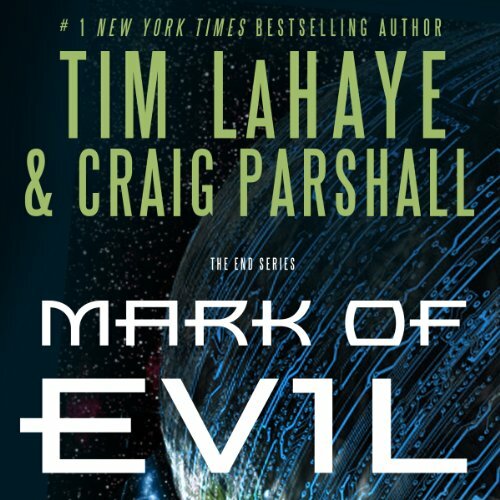 From New York Times best-selling author Tim LaHaye, creator and co-author of the world-renowned Left Behind books, and Craig Parshall, Mark of Evil is the final thrilling chapter in The End series. With high-tech thrills against a background of prophetic events that seem to leap from today's news, this is the story of global tribulations bringing the world one step closer to the reign of the Antichrist and the return of Jesus Christ in glory. What disappointed you about Mark of Evil? Probably a good book?.... But couldn't listen to it... the Narrator is awful... totally ruined the end of the series!!! I very much enjoyed the story line but the narration was the most distracting annoying narration I've ever had the displeasure of listening to. The narrator sounds as if he's an overweight heavy smoker who smacks his lips constantly and emphasizes the wrong words in the sentences so that you don't quite get what he's saying. If I hadn't wanted to finish the story so badly I would have stopped listening. Would you be willing to try another one of Daniel Butler’s performances? Not this one, I has listened to the entire series and this just does not even compare to the others in the series, I wondered if they authors truly wrote it or if someone else ghost wrote it. No, his voice gets on your nerves. What character would you cut from Mark of Evil? I read the reviews and most were bad but I thought really how bad could it be the others were great. I think Joshua Jordan (the character that was raptured in the last book) was what carried the entire story...should have ended there. It wasn't the book itself that was awful, but the narration. I will most likely purchase the kindle edition and read the book rather than suffer through this narrator. Would you be willing to try another book from Craig Parshall and Tim LaHaye ? Why or why not? Oh yes indeed! I enjoy their books! The stories are so exciting and well written, that you get lost in their world and completely forget reality for awhile. Never ever again. Not even if it was free. If you could play editor, what scene or scenes would you have cut from Mark of Evil? I haven't finished the entire book yet, but so far, so good! I will be reading, rather than listening, to the remainder of this book due to the horrible narration. This was my first ever return, and Audible was wonderful about it. My advise is to read reviews, even if it's a series book with a familiar author. Lesson learned! The narrator ruins the book! They changed narrators after using the same wonderful narrator for the first three in this series. This narrator is probably a nice guy, but you cannot listen without cringing. It was awful! What made the experience of listening to Mark of Evil the most enjoyable? The story followed the Bible. The old rabbi because he brought back warm memories of the Left Behind series. Had to concentrate hard or my mind wandered. Also, was distracted with mispronouncement of Names. Really missed Stefan's narration. Originally yes, but the narrator kept putting me to sleep. I know the story, but the narrator made it incredibly boring to listen. I could not continue because of that. I would return it if I had not had it for a while. I always purchase books ahead of when I might actually listen to them. Could not listen long enough to determine this. Will you exchange this book for me? Using the previous narrator would have been better. It is already a long, uncut story and the narrator seemed to draw out that fact. Given Ethan March a better conversion story to Jesus Christ. I got it but I would rather the writers start this story right at the Rapture and then move on. What didn’t you like about Daniel Butler’s performance? Everything. . .I know he tried to change voices according to character but it didn't work! Especially the Asian character; he sounded like Mr. Moto. Just terrible characterization. Having read the Left Behind Series and The Last Jihad series by Joel Rosenberg. . .this particular book seemed not to have that spark (or purpose). I was into the story but the narrator was different than the other 3 books. I listen to lots of audiobooks but this narrators voice was very uncomfortable. I found the paperback on Amazon and bought it so I could read the rest of the story which was interesting for the little bit I heard before I returned the book. Story could be better if the author didn't feel the need to reintroduce every character several times throughout the book. Narrator was just terrible. A good story made unbearable by a narration without diction and the appearance of a drunk slurring his words. It was mostly indecipherable. Sad to say, bur the narrator destroys the good story. This ate the first Christianfiction books I have read. They were exciting, uplifting and challenging.